Discussion in 'New Members' started by jmdaniel, Oct 20, 2010. Why KC? 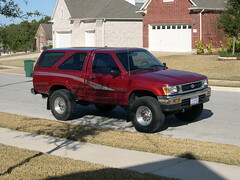 Because the dealers in Central Texas are quite delusional in what they think their vehicles are worth, and what your vehicle is not! Kinda kick myself for unloading it, but I definitely got my use out of it, and got top dollar when I sold it. The new one will have a few more modern comforts, a 6 instead of the 4, and space behind the seat, as I'm getting an Access Cab. I know my dogs will love riding in the new one, they had to go in a crate to ride in the FJ, due to the crappy plastic Toyota puts in those vehicles. Sneeze, and you get a scratch! I'll be putting a shell on it, a slight lift, and some bigger tires, and in the garage, it will sit next to this toy, a '77 FJ40 I recently picked up. Forums of like minded folks are great sources of info, and I'm looking forward to spending time here! Welcome to TW from Richmond, TX. Man, I had that same issue in Abilene. The dealer here just wouldn't budge on their price, which I thought was ridiculous. Had better luck in Fort Worth though. 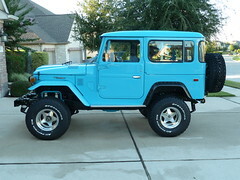 I really like your FJ40, it's very clean! Picked up the Taco yesterday at Performance Toyota in KC, Kansas. Hats off to them for being straight up from the very beginning, Charlie Ross to be specific. And a big F you to all the Toyota dealers in Central Texas. $18.5K for a super clean '07 FJ Cruiser with 26K miles? Not born yesterday, fellas... Performance gave me $3K over that, AND sold the Taco at NADA invoice! Took off from the house at 3am, got back with the new Taco at 2:55am this morning. Hey, had to, otherwise I couldn't call it a day trip, right? This thing needs a lift and tires, STAT! And I needed to rearrange my garage, as it is looooong.